In this article, I am going to use JQuery with json data and web method to update/delete in grid view without sending page to the server and without putting grid view in edit mode. I am going to show the update operation, but one can easily use it for delete operation with little changes. The grid view is a very powerful control to present tabular view of data. It is equipped with all the necessary features of server side data processing. But sometimes we need to edit small data (in the form of record) to the database very frequently and we do not want the page to have a round trip to the server. Though we can achieve this (partial post back) using "Ajax", but then the end user need to make some "extra" clicks for putting grid view in "edit mode" and as a developer we need to write some additional block of codes and handle some grid view events along with a little performance hit. In the below lines, I am going to show how we can update/delete the grid view's row using JQuery with the use of json data. This way the page needs not to be sent on server at all. I this example, I used the "Products" table of "Northwind" database. If you want to run the below code snippet, you need "Northwind" database installed in your SQL SERVER database. Now let us directly jump to the codes. I explained all the necessary details in the code itself. The code below is built on .NET framework 4.0 and successfully tested on Internet Explorer 9 and Firefox. You can have any numbers of "BoundField" and "TemplateField". The important thing is the "CssClass" of the textbox, which we are going to use in our JQuery function. 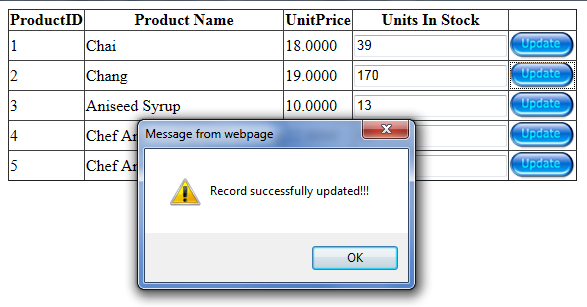 Also I am updating one column, for that textbox is used so that user can edit the value inside textbox. You can update any number of columns by putting the column in "TemplateField" and using textbox. var update_data = $(".stock", row).val(); //stock is the CssClass name of the textbox. In the above function, I am calling a web method named "UpdateProduct", which actually updates the record to the database. I'm new to jquery/json. 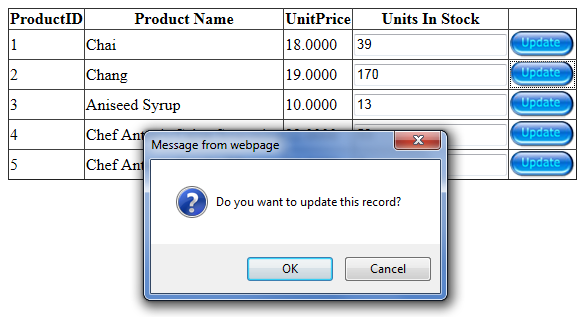 I got a task to insert update and delete the grid(gridview or jqgrid)and update in the sql using jquery /json. For insert and delete, you can use the above code. As far as displaying the data while inserting, you can use textbox blur event to display the data in some label control below the grid view. How to do the same for Delete operation ? a href="#" id='# Eval("ProductID")' class="updatebutton"
Can U please let me know if the editindex can be set with the help of jquery and the gridview can be made to display n the edit mode .